Sorry for the really late post today.. I was in Bath Sunday, Cardiff yesterday and then today my laptop has been playing up. Typical eh? Anyway, this post is about my mani that I had yesterday. I kept this simple as I did it late Sunday night using Supersonic from the Barry M Speedy collection and did a sort of gradient from the bottom of the nail using Diamond Glitter, also from Barry M. I will be using other nail brands soon I swear! 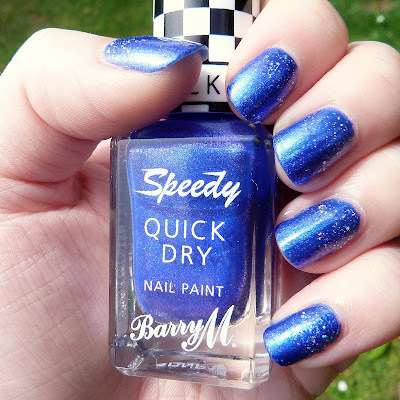 In case you can't tell I really love the Speedy nail polishes. The colours are great, the brush is wider so it's easy to apply the polish and they dry quickly which is fab if you're impatient to do your nails like me. I actually planned to do this mani with You Drive Me Navy from the Sunset collection but as it was late I wanted to do it quickly so I could go to bed. Because of this the glitter doesn't stand out quite as well as it would have due to the sparkle in Supersonic but it still adds a little extra. I love the bright blue of this polish, maybe because it reminds me of the TARDIS (inner Doctor Who fan coming out there), and the sparkles in it make it 10x better. It's just a shame either my camera can't capture all the sparkle or I'm just not good enough at taking photos yet. It's highly likely it's the latter! p.s. 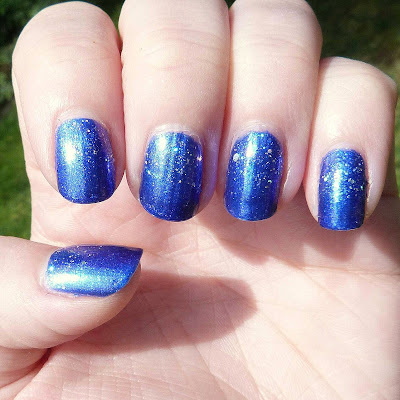 - I've changed my blog name to Polished Dreams as I've decided it'll just be focused on nails and nail art. I enjoy it too much to do anything else!